Adorn your living space or office with this gorgeous limited edition bronze statue by world renowned artist Lorenzo Ghiglieri. This beautiful white tail buck is sculpted with incredible detail, bringing a touch of wildlife right into your home. Only 125 tickets available and the drawing will be held once all the tickets have been sold. 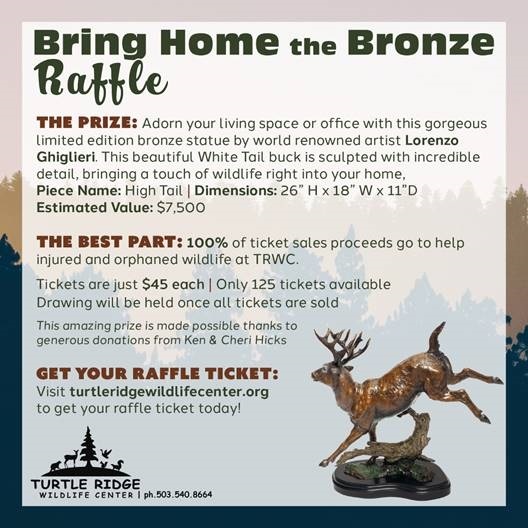 100% of ticket sales proceeds go directly to the care of the animals at Turtle Ridge Wildlife Center.